UFO.Whipnet.org | Aliens | UFO | General Wesley Clark - UFO Expert? General Wesley Clark - UFO Expert? 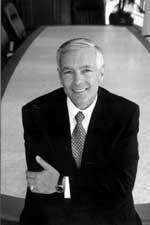 Wesley Clark (retired General, U.S. Army) was most recently chairman of Wesley K. Clark & Associates, a strategic advisory and consulting firm. He is chairman of the board at WaveCrest Laboratories, a firm now developing a breakthrough electric propulsion system. (His current job is very interesting, as it appears that Mr. Clark is acting upon some of the knowledge that he retains about UFO's. Is WaveCrest his team of mathematicians? ..John) He also founded Leadership for America, a nonpartisan, not-for-profit organization dedicated to fostering the conversation about America's future. From 2000 to 2003, Clark served as a managing director for the Stephens Group, Inc. He served in the U.S. Army for more than 35 years and rose to become NATO supreme allied commander and commander in chief of the U.S. European Command from 1997 to 2000. From 1996 to 1997, Clark served as commander in chief of the U.S. Southern Command, Panama. From 1994 to 1996, he served as director for strategic plans and policy for the Joint Chiefs of Staff, with responsibilities for worldwide U.S. military strategic planning. Wesley K. Clark was born in Chicago, Illinois, in December 1944, an only child of Veneta and Benjamin Kanne. His father died and he moved with his mother to Little Rock, Arkansas. In 1954, Veneta married Victor Clark who became Wes Clark's stepfather. 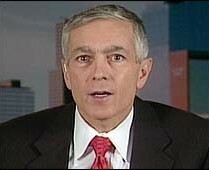 In 1962, Wesley Clark was admitted to the United States Military Academy and began a 38-year career of public service in the United States Army, where he became a four-star general. In 1994, General Clark was named Director for Strategic Plans and Policy of the Joint Chiefs of Staff, Pentagon. In 1995, General Clark traveled to the Balkans as the military negotiator with Ambassador Richard Holbrooke in a United States effort to end the war in Bosnia, the bloodiest war in Europe since World War II. A few months later, General Clark played a vital role in creating a peace plan in the Dayton summit which ended the war. In 1997, after serving as Commander-in-Chief of the U.S. Southern Command, General Clark was selected for one of the top posts in the military : Supreme Allied Commander of NATO - a position first held by General Dwight D. Eisenhower. As Supreme Allied Commander, General Clark commanded NATO forces during the war in Kosovo. Recently Roswell UFO crash researcher, David Rudiak, did ask General Clark that question and received a remarkable answer. Grant Cameron explained for me this week the background behind the General's reply. Gen. Clark Discussed "Beyond the Speed of Light"
Grant Cameron, UFO Investigator and Director, Presidentialufo.com, Winnipeg, Manitoba, Canada: " The first event occurred on September 27, 2003, at a private home where his campaign was just getting going. Wesley Clark ­ who is a 4-Star General, the highest military rank that exists today ­ was in Newcastle, New Hampshire, and was asked a question by Jay Buckley, who was an astronaut on the space shuttle what his (Clark's) vision for space was. Wesley Clark said he believed it was possible that we would be able to go past the speed of light. "I still believe in E=mc2, but I can't believe in all of human history we've never been able to go beyond the speed of light to reach where we want to go. I happen to believe that mankind can do it." Note : The first media to report General Clark's reply to Jay Buckley was WIRED NEWS: 9/2003 NEW CASTLE, New Hampshire -- "Wesley Clark: Rhodes scholar, four-star general, NATO commander, futurist? ( WIRED's first story version used the word "fanatic" which was later changed to "futurist.") During a whirlwind campaign swing Saturday through New Hampshire, Clark, the newest Democratic presidential candidate, gave supporters one of the first glimpses into his views on technology. "We need a vision of how we're going to move humanity ahead, and then we need to harness science to do it," Clark told a group of about 50 people in New Castle attending a house party -- a tradition in New Hampshire presidential politics that enables well-connected voters to get an up-close look at candidates. Then the 58-year-old Arkansas native, who retired from the military three years ago, dropped something of a bombshell on the gathering. ... Einstein's theory of special relativity says that time slows down as an object approaches the speed of light. Some scientists say that FTL travel therefore implies time travel, or being able to travel to the future or the past. Clark's comment about FTL travel came at the end of a long answer to a question about his views of NASA and the U.S. space program. Clark said he supports the agency and believes "America needs a dream and a space program." But Clark said the nation must prioritize its technological goals and take a pragmatic approach to focusing its scientific resources and talent. "Some goals may take a lifetime to reach," he said. "We need to set those goals now. We need to rededicate ourselves to science, engineering and technology in this country." Grant Cameron: "I was very surprised that Clark made this dramatic statement about going past the speed of light, that he believed it and argued (with scientists) about it as a 4-star general ­ and NOBODY asked him a question about it?! He went through the entire campaign until last Saturday night and nobody asked him, 'What are you talking about, General? What do you mean going faster than the speed of light? Where did you get this from?" Everyone was just silent. A number of researchers said they did not want to be embarrassed asking the question or they had someone in their family who would come under government scrutiny if they asked the question. Basically, Clark went through his whole campaign and eventually pulled out of the race and no one asked him the UFO briefing question until last Saturday, October 23, 2004. The questioner was David Rudiak." David Rudiak has a Ph.D. in physics from the University of California, Berkeley. David used a digital photo scanner to enlarge and enhance words printed on the folded piece of paper General Ramey held. Then he used another computer program to select the most likely words on the paper and found two key phrases: "and the victims of the wreck" and "in the 'disc' they will ship." July 1947. Red rectangle highlights the communique to Washington, D. C., Gen. Ramey is holding. on or about July 4, 1947. Photograph © 1947 by Fort Worth Star-Telegram. Grant Cameron: "David Rudiak is probably one of the foremost experts on the Roswell UFO crash story and has an excellent website on Roswell. He e-mailed me on Sunday morning (October 31, 2004)) and told me he had been on business in Reno, Nevada, and had come cross Wesley Clark (now out of the Presidential campaign). Gen. Clark was campaigning for Sen. Kerry during the Presidential campaign. Rudiak watched Clark's speech and afterward, he went up and asked the General my briefing question. Note: "Aviary" is the bird-named group of UFO investigators allegedly linked to government insiders who have leaked information - officially or unofficially - about non-human entities and technologies. That's why I pushed very hard for people to actually confront General Clark with the question: 'Have you ever been briefed (about UFOs)?' I wanted to see what a 4-star general with classified access would answer, which did not happen until Saturday night, October 30, 2004, thanks to David Rudiak. I think in that exchange that Clark basically confirmed he knows something about what is going on. WHAT YOU MEAN BY 'CONFIRMED' IS THAT HE DID NOT BRUSH MR. RUDIAK'S QUESTION OFF. HE SAID THAT WE WILL HAVE TO WORK OUT THE MATHEMATICS, IMPLYING THAT THEY HAVE HAD SOME EXPOSURE TO A TECHNOLOGY AND SOMETHING OUT THERE, THE INTELLIGENCE BEHIND IT WHICH IS NOT HELPING US? WE ARE GOING TO HAVE TO HELP OURSELVES? Yes. In fact, it struck me that there are a number of times when high ranking people have been asked about this and they have brought up this thing about mathematics. Editor's Note : Penn State's History of Mechanical engineering states: "Eric A. Walker became the sixth dean of engineering at Penn State. Eric Walker was born in England, but spent his youth in Wrightsville, Pennsylvania. He was educated as an electrical engineer and received his Ph.D. and M.B.A. from Harvard. During World War II, he participated in the underwater acoustic research program at Harvard. Following the war, the entire underwater acoustic program was transferred to Penn State and became known as the Ordnance Research Laboratory (ORL). Eric Walker was the original director of ORL and also head of the electrical engineering department. "Eric A. Walker, Dean of the College of Engineering and Architecture, was a strong proponent of research. In 1956, Walker became University Vice President for Research and within five months, he became Penn State's twelfth President. Under President Walker (1956-70), the University expanded more rapidly than ever in its history. The enrollment climbed from 13,000 to 45,000, and the budget grew from $34 million to $165 million. A hundred new buildings were constructed on the University Park Campus alone." A second incident that popped into my mind when I heard General Clark talk about the mathematics was Jan Hartzen who runs the Orange County MUFON. He was in a 1993 lecture given by Lockheed's original Skunk Works Director, Ben Rich. Ben Rich, original director during Cold War of Lockheed's highly classified "Skunk Works." 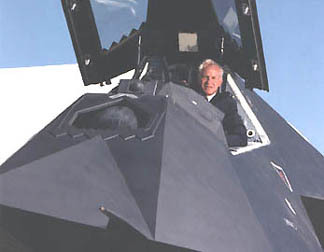 Rich is in the cockpit of a F-117 stealth fighter, one of his Skunk Works projects. Photo credit: NASA. According to Jan Hartzen who was in the auditorium listening, Ben Rich said we have the technology to 'take ET home.' And Lockheed Skunk Works is where it's believed a lot of UFO technology back-engineering has been done. Another thing that Jan told me was that Ben Rich was talking about the mathematics ­ that we've found the thing that we are missing, the part of the equation we have been missing ­ we've figured it out. If you know a number of people who are working on the zero point energy stuff ­ Hal Puthoff and people like that ­ they are always talking about the mathematics. And mathematics in this whole UFO mystery is very important. That's the key, the mathematics. And strangely enough, in October 2004 we have General Wesley Clark bringing up the idea of mathematics being important. No, not as far as I know. It was one of these things after a speech where you are shaking hands and you have only fifteen seconds to get in what you want to say. I did check and found out that General Clark was in Roswell. He was going to Roswell right after that lecture. So David brought up UFOs and General Clark brought up Roswell, as if the two are connected, which would seem to indicate some confirmation of the Roswell crash. Clark was very interested in space. He wanted to be an astronaut. He's in the Army, but he wanted to be in the U.S. Air Force. He couldn't, though, because he is short-sighted and could not get into the USAF. So, he went to West Point and into the Army. I followed his presidential campaign website all the way through. He met with people like the Mars Society. They described their encounter with him as, 'We were blown away!' When they asked him questions such as, 'What about a trip to Mars?' He said he wanted to speed the trip up. He said, 'I think we should be looking at new propulsion and enabling technologies.' He did not really want to go to places we had already been. They described Clark when he talked about space to the Mars Society as having fire in his voice. In that sense, he's a guy who is very interested in space and has not had to address the UFO question, but is still hiding what he actually knows. But I would say he probably has enough that he could break it open. So to me, it's an important thing to ask presidents and 4-star generals about UFOs, rather than people who are just in the military. The leaders carry a lot of weight, what they say carries a lot of weight, and if one of these people should start to talk or be confronted by the media, it could break the story wide open. We might get somebody on the record who has to tell the truth and will tell us what is actually going on. People like Clark should know what is going on. BUT AFTER 60 SOME YEARS, IT IS STILL NOT IN THE INTEREST OF THE UNITED STATES NATIONAL SECURITY INTERESTS TO OPEN UP THE EXTRATERRESTRIAL BIOLOGICAL ENTITY SUBJECT. Exactly. And why haven't the aliens come forward? Why are the aliens covering this up? The aliens are doing the same sort of thing as the government, dropping little hints that they are there, little indications. But I always maintain that they could land on the White House lawn and end this (mystery) tomorrow. They don't. There might be a very good reason behind the scenes why the aliens and the U. S. government are both gradually. I'm doing a lecture in Las Vegas about the vast majority of things we believe today in the UFO community are not things we discovered (independently.) 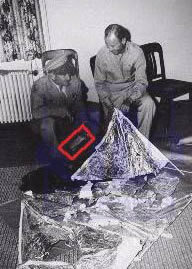 They are things that have been leaked to us by the U. S. government, whether it's Area 51, MJ-12, crashed saucers. This is all stuff that has been gradually leaked to us and our world view has been formed by the U. S. government. The aliens, I think, are doing the same sort of thing ­ leaking little things and making us more and more aware all the time. But no one is coming out to end the cover-up. I think the government and the aliens could both do it. They haven't, which indicates to me there must be something behind the scenes that we have not explored carefully enough and we should look at: why are they doing this? What is the thing that is stopping them from coming public? That's when he stumbled and said, 'If I had been briefed,' - and he knew what the word meant - 'if I had been briefed on that subject, it probably would have been classified and I would not be talking about it.' That basically confirmed to me there is something to it. But no reporters picked up on Cheney saying that the subject of UFOs was probably classified. But it's just a matter of getting somebody at the right time and then some reporter following up with: Is there some truth? What were you told in your briefing? So, it's the whole thing that once you have a briefing and he confirms he has been briefed, then you can go to the White House and say, 'I want the date of the briefing.' He was briefed and you should be able to get an official time and date. But you can go to Presidential Archives and you can check all you want and there is no record ."